The Snowy Owl migrates to New England during the winter months. In New England, it is common to spot snowy owls each winter from November through March and later in the more northern states. The Snowy Owl’s natural habitat is the arctic tundra, but during the cold winter months it migrates south where it finds an open field or, more likely, coastal beach, marsh or area with low, scrubby vegetation that resembles the landscape of its home territory. 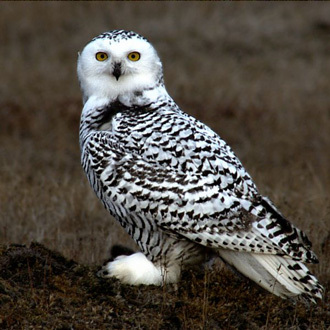 The Snowy Owl is a white owl that has a rounded head, yellow eyes and black bill. The adult male is almost entirely white, while the females and young owls often have black horizontal bars or spots. What makes them truly distinctive, in addition to their color, is their size. An adult male has an average wingspan of between 20”- 27” making it the largest owl in New England. The Snowy Owl is virtually silent during non-breeding seasons. The typical call of the male is a loud, harsh, grating bark, while the female has a similar higher pitched call. During the breeding season the male mating call is a booming “hoo, hoo,” while females rarely hoot. Some Snowy Owl calls can be heard here. 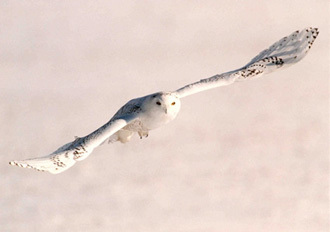 Unlike most owls, Snowy Owls are active during the daytime and mainly hunt lemmings and voles which they eat whole. When these prey are scarce they’re opportunistic and will take a wide range of small mammals (including mice, hares, squirrels, rabbits, and moles) as well as birds. The Snowy Owl perches high and sits silently waiting for a hunting opportunity to present itself. 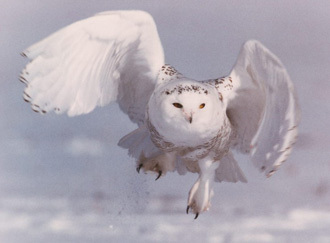 Once potential prey is seen, the Snowy Owl takes short, low flights to capture its target on the ground, in the air, or off water. The Snowy Owl has numerous other names and these include the Snow Owl, Arctic Owl, Great White Owl, Ghost Owl, Ermine Owl, Tundra Ghost, and the White Terror of the North. It is perhaps unsurprising that with names like these, J.K. Rowling decided that Harry Potter’s owl, Hedwig, was a Snowy Owl. But it is not just the owl’s appearance that lends itself to these names. 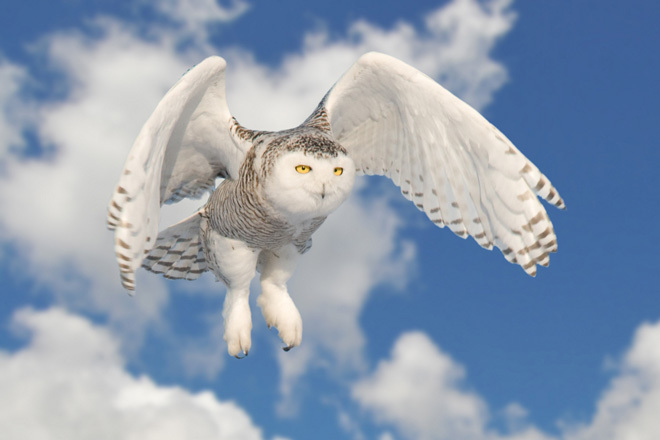 The Snowy Owl is virtually silent in flight, making it a highly successful predator. Snowy Owls can live to at least 10 years in the wild and 35 years in captivity. They have few natural predators, with man being its biggest threat from power cables and intrusions into its habitat. In Maine, New Hampshire and Vermont, the Snowy Owl is much more prevalent in winter than in southern New England but there are a number of accessible locations in coastal Massachusetts, Rhode Island and Connecticut where birdwatchers can spot a Snowy Owl. Logan airport is well-known for being a favorite stopping point for Snowy Owls. According to Mass Audubon, Logan typically has the largest concentration of Snowy Owls in the northeast. A more accessible location is Plum Island, a strip of land on the coast between Ipswich and the New Hampshire border. Salisbury Beach just to the north also offers good viewing opportunities. Duxbury Beach, a few miles north of Plymouth, is another spot well-known for harboring Snowy Owls. Sachuest Point National Wildlife Refuge in Middletown has a reputation for being the place a birder will most likely see a Snowy Owl in Rhode Island. Alternative shoreline areas include Beavertail Point State Park in Jamestown, Camp Cronin at Point Judith, Trustom Pond National Wildlife Refuge in Charlestown, and the Misquamicut Beach - Watch Hill area, which includes Napatree Point. Birdwatchers in Connecticut who hope to spot a Snowy Owl have to rely on much more luck. The owls aren’t known to frequent any one place but past sightings have occurred at coastal points in Bridgeport, Milford, Norwalk, Stratford and Westport.